Population (1 Jan 2003): 265.102; area: 99,32 km². Settlements: Utrecht (seat), De Meern, Haarzuilens, Vleuten. On 1 Jan 2001 the former municipality of Vleuten-De Meern merged with Utrecht city. Flag adopted 5 Jul 1990. Description: diagonally divided of red and white. Description: Diagonally divided of red and white, with in white St. Martin. This flag was adopted 27 Apr 1948 by resolution of Mayor and Aldermen. The oldest picture of this banner is by Joost van Atteveldt, in the year 1648. However already in 1537 Emperor Charles V, jealous of the saint, who reminded him of the Bishop of Utrecht, ordered that Mr. Willem van Noert should remove the image of St. Martin from the Utrecht Coat of Arms, or overpaint it with white paint. The image of van Atteveldt was already 200 years or more old, so this is probably one of the oldest documented flags of the Netherlands. Mayor and Aldermen, however, ordinarily use a flag with an empty white field. 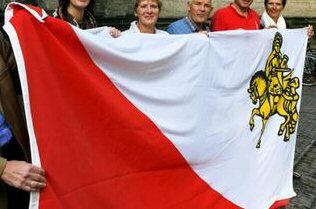 The real citybanner, in use since the citizens of Utrecht presented it on 5 May 1956, does have the image of St. Martin. Source: Sierksma's Nederlands Vlaggenboek, 1962 [sie62]. One can see an image of the present flag of the city of Utrecht, with on the white field a yellow image of St. Martin. It is an encouragement to fly the "Utrechtse stadsvlag" on 11 November, the nameday of the Saint. On the FOTW-page about Utrecht St Martin is depicted white contoured black. Description city-banner/ensign: square, hoistdiagonally white over red; on white in yellow St Martin, riding a horse, cutting half of his mantle and presenting it to a beggar. PMS-code: red: 032U or C; white: opaque; yellow: process yellow. Adopted by the Municipal Council on 27 April 1948. Design: conform the old city banner from the 15th century. The city-banner was planted in front of the City Hall in times of unrest and revolt. Able citizens went to battle following it." A very old depiction of the banner can be seen in the manuscript "Remissiorium Philippi", at the time offered by the artist, Peter van Boostenzwene, to Count Philip the Good, Duke of Burgundy and Brabant, Count of Holland. At present part of the National Archive in The Hague. On a miniature one can admire the submission of the citizens of Utrecht in 1345 to Count Willem IV of Henegouwen and Holland. All minitiatures can be viewed digitally in the "Beeldbank van het Nationaal Archief". It is evident there that St Martin with horse and beggar were depicted in natural colors on his half of the banner." The football club "FC Utrecht" was founded in 1970 by the merger of "DOS" (winner of the national championship in 1958), "Velox" and "UVV Elinkwijk". "FC Utrecht" won the national cup in 1985, 2003, 2004. One of the most ardent supporter of FC Utrecht is Simone Koot (b. 1980), winner of the gold medal in the Beijing Olympics with her team mates from the waterpolo Dutch national team [hartelijk gefeliciteerd]. She displayed the flag of FC Utrecht on her balcony in the Olympic village in Beijing, as shown on a photograph published by "RTV Utrecht", 15 August 2008. The flag of FC Utrecht is horizontally divided red-white-blue (therefore the Dutch national flag) with the club shield in the middle. The shield is diagonally divided by a blue ascending diagonal stripe bearing "UTRECHT" in white. The upper part of the shield is white with a red "F" while the lower part of the shield is red with a white "C".